I think the tablet world is taking crazy pills, because there are deals aplenty going on lately. 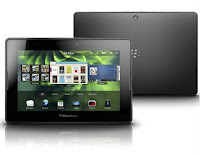 Today eBay is offering this new BlackBerry PlayBook 7" Tablet for just $150, and tossing in FREE shipping to boot! This thing retails for $700 (that's 78% OFF the regular price). This little guy weights less that a pound and comes with a USB cable, charger, and cleaning cloth. I don't own a BlackBerry, but I might if I owned this because you can pair it with their smartphone to share apps and internet connection.